Every time I turn on the TV my eyes are flooded with commercials promoting new remedies for aches, pains, and disorders. They often include an overjoyed person dancing or baking a cake while a soothing voice reads off the endless side effects of the drug. “Upset stomach, wild dreams, or nosebleeds may occur," says the soothing voice, “However, your affliction will be controlled for 12 hours.” Geesh! But we have a whole cabinet full of them- a pill for inflammation, a pill for blood sugar control, a pill for the nausea we get from taking the blood sugar pill and on and on. Thinking back to my grandmother’s house- she had many pills but she also had other mixtures, oils, and potions for curing ailments. Sometimes an onion in a sock, sometimes horseradish with olive oil… whatever discomfort you had- Grandma knew a cure! Which old wives’ tale rang true for you? I’m not suggesting that traditional medicine should be thrown out the window. But I do want to explore how to incorporate oils into daily routines for enhanced well-being. Essential oils have been around for hundreds of years with documented uses dating back to around 1500 BC. 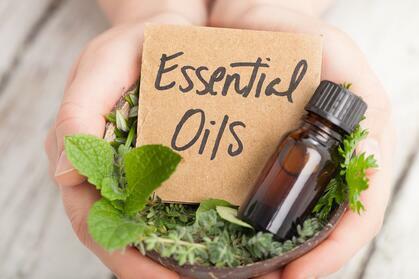 Essential oils are a concentrated liquid that contains a plant’s chemical properties. Each oil has a unique property and potential effect depending on the plant from which it’s derived. They are extracted through steam distillation and cold pressing, making the extracts full of potent antioxidants. Essential oils can be used topically. They can also be inhaled or ingested. When used topically be sure to dilute a few drops of the essential oil with a carrier oil. Carrier oils include grapeseed, olive, coconut, and jojoba oils. They act as a base oil and do not affect the effectiveness of the essential oil. They absorb easily into the body due to their tiny molecular structure. Oils can be applied behind the ear, on temples, soles of the feet, or directly to the area of concern. The technique of inhaling the oils for relief is called Aromatherapy. Simply sniff the oil scent directly from the bottle (1 to 2 inhales is all you need), or a diffuser can also be used. Only consume essential oils which are labeled safe to do so. One drop of cinnamon oil is all you need to elevate that Saturday morning French toast recipe! Or, you can add a few drops to water or yogurt. Some oils can be dropped into a capsule to swallow. Here are a few ailments and the essential oil that may help to eradicate common aches and pains. Please note the information in this blog is meant to serve as a guide. It is not meant to diagnose, treat, cure, or prevent any disease. Interactions between oils and other over the counter or prescription medication can occur; always consult your physician before altering your medication plan. Inflamed joints can be soothed with the help of the frankincense oil. In a hot bath it works to nourish the skin and stimulate the body’s immune function. Remember where you left your keys with the help of rosemary. One study from Northumbria University found that being in a rosemary scented room could improve memory by 15% in older people. Dealing with an itchy scalp and or acne is no fun. A few drops of tea tree oil works to clear it in a hurry. Add to your conditioner or mix with Aloe Vera gel and apply. Battling infections? Oregano and thyme oil have supreme antibacterial properties. If taken orally, ingest in smaller doses with food over 10-14 days. If you’re having trouble falling or staying asleep, lavender oil may send you off to dreamland. Spray the oil around the room before bed, diffuse, or place a few drops in your body lotion and massage into your hands and feet. Support healthy joints and ease away pain with a blend of wintergreen, peppermint or black pepper oils. Dilute and massage it into the skin. Tummy troubles? Give cool, bright peppermint oil a go. Add a few drops to herbal tea. Many brands may be ingestible but that’s not always the case, so read the labels carefully. The effects of essential oils on the human body are still being researched. But the claims of those who use them are astounding. Call it an old wives’ tale or a miracle but some of these remedies may be worth a try if you’re open to alternative health methods.